Let this classic colonial american style bed transform your bedroom suite! This solid wood bed is handcrafted in your choice of Oak, Brown Maple, Cherry or White Maple wood. The Amish American Heritage Spindle Bed is constructed with a simple yet beautiful headboard and footboard. This heirloom quality bed is handmade with a timeless design that can last for generations. Choose from 4 different bed sizes today to create an oasis in your bedroom suite. This Amish made bed is available in a twin, full, queen or king size bed. 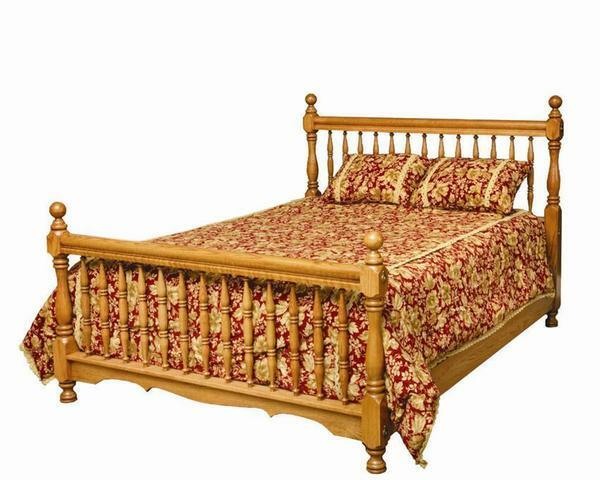 Please call with questions on our Amish American Heritage Spindle Bed today at 866-272-6773. Our Amish furniture specialists will be happy to help you with an order or answer any questions on our Amish bedroom furniture.